As a “serious” runner for 3 years now, I can tell that you almost all my gift wishlists are dominated by one thing: running. This Holiday season is no exception. I’m hoping Santa will bring me some much needed new running shoes, a few races registrations, and maybe leave some gu in my stocking! If you know a runner, chances are running is a huge part of their life. I’m sure they’d love any (or all!) of these perfect gifts for runners. Socks. I know, I know, it takes you back to the time you were opening presents as a kid at Grandma’s house and everyone got a package of plain white crew socks for Christmas. But running socks are much more exciting to receive – I promise! As with most items on this list, be careful not to go out and get what you think would be best. While that would be thoughtful, most runners are extremely particular about the items they use while running. Certain socks may rip up their feet while others make them feel like they’re running on clouds. Take a peek in their drawer one day and find the brand/style they like before shopping. Running Shoes. Most running shoes need to be replaced after 300-500 miles, so this is a top expense for runners. I go through 3-4 pairs a of running shoes every year and ask for a new set almost every birthday and Christmas to prevent continually draining my bank account over running gear. As with the socks, take a peak at their shoes one day to see the exact brand/style they use, or just get a gift card to your local running store ($125-150 will cover the cost of most shoes). Running Safety Gear. If you have a runner who runs at night, this is particularly important. I often see runners out at night while I’m driving and, without any reflective gear on, I don’t see them until I’m about 10-20 feet away. That’s not a lot of breathing room in case something goes wrong! If you look up “reflective running gear” on Amazon, you’ll see many varieties. I love the flashing LED lights you can clip onto the back of your shirt. The knuckle lights are great too, but not all runners like to carry things while they run, and headlamps are also a good choice, but many runners find wearing them uncomfortable. You can also buy mace to run with, expandable batons, and panic alarm systems that you can wear around your neck and activate with the press of a button. Gu Packs/Running Nutrition. If you have a distance runner in your life (anyone who’s running half marathon lengths or longer), these would make great stocking stuffers. Keep an eye out to see what they normally use (Gu packs, gummies, etc.) and try to pick some up in a few new flavors you think they’d enjoy. Be careful with the Gu though, as some varieties contain caffeine; if your runner doesn’t like caffeine, steer clear of those flavors. Water Bottles. Some of my friends tease me because I won’t run unless I have my water bottle with me, even if it’s just a 2 or 3 mile run. I’ve been using a handheld system by Nathan 3-5 times a week for years and have only had to replace it once – I’d say that’s a great investment! It also has a pocket on the side that’s great for holding my phone, a credit card/ID, and a key. Medal Hanger/Bib Holder. If your runner has a few medals that are being draped from the dresser mirror (as mine were) or stuffed into a drawer (as some of mine were as well) then giving them a way to proudly display their accomplishments would make a great Holiday gift. You can find wonderful handmade and customized ones on Etsy or Amazon . Winter Running Gear. Gloves compatible with touchscreens (many runners use their phones to track their runs) and headbands/ear warmers would be great gifts for any runner who runs under 40 degrees regularly. Stocking Stuffers. In addition to Gu, any of the following would make great stocking stuffers: running stickers for their car (5k, 13.1, 26.2,…), running magazines, body glide, pace stickers or bands if they have a goal time they’re training for, disposable hand warmers, and best of all …. a gift certificate for a well earned massage! 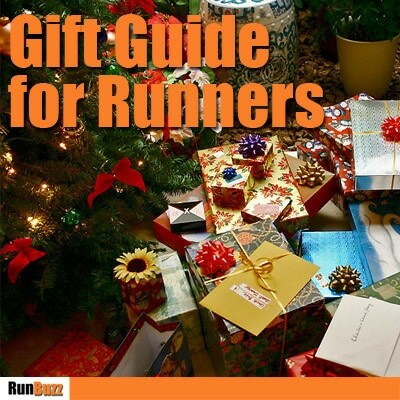 Share RunBuzz gift guide with friends!